Eileen, Paul & Ashley at the community centre. Modifying the Youth Centre and adding a new dedicated outdoor play area to enable the Children’s Centre to operate from this space during the day (including offering adult learning) whilst still allowing the space to be used for youth/hire at other times. This makes better use of the youth club and makes the children’s centre more visible and provides a better space to run activities from. Maintaining comparable space for hire with a new meeting room formed to compensate for the library moving into a meeting space. 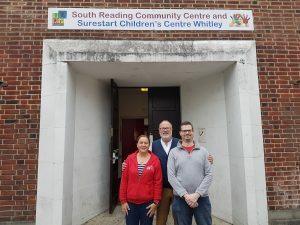 The Centre will continue to be open over the period of construction for the use of the Nursey, Children Centre and Cafe only where no major building works is scheduled to take place. No bookings will be taken for community hire over this period. We have worked with the Nursery and Children Centre to provide alternative safe access for its staff and users into the building. Whilst the Café will continue to use its existing main entrance for most of the construction period. The works to provide 6 car parking spaces at the Well Centre replacing the loss of the 3 car parking spaces in front of the Centre is now complete. Display boards to inform the community about the start of the works at the Centre and Whitley Library and regular progress updates will be provided to the community over construction period as well. This entry was posted in Ward News on November 25, 2017 by Ashley Pearce.